Senate panel approves Brett J. Talley, a lawyer without trial experience, for federal bench. 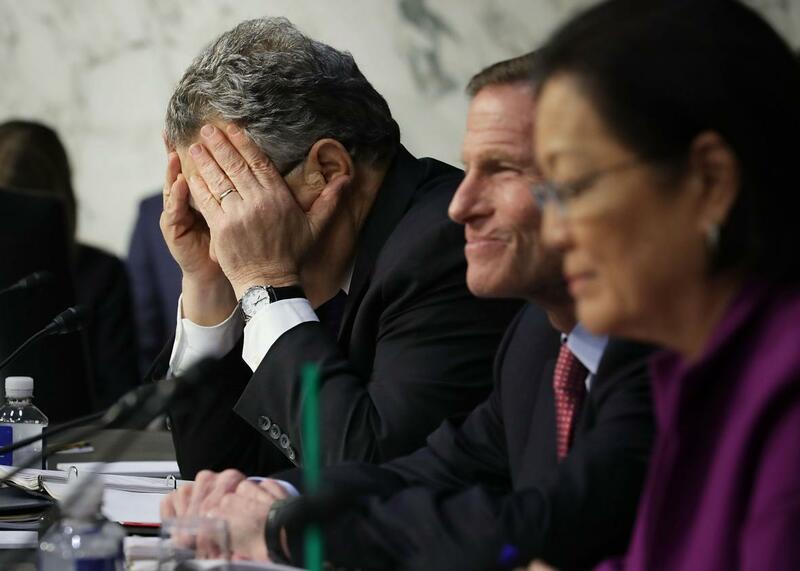 Senate Judiciary Committee member Sen. Al Franken (D-MN) (L) covers his face in frustration as he questions witnesses from Google, Facebook and Twitter during a Crime and Terrorism Subcommittee hearing in the Hart Senate Office Building on Capitol Hill October 31, 2017 in Washington, D.C. The Senate Judiciary Committee seemed to prove this week that it will rubberstamp any judicial nominee President Donald Trump sends over, no matter how unqualified. On a party-line vote, the panel said this past week that Brett J. Talley should have a lifetime appointment to the federal bench in Alabama, reports the Los Angeles Times. It apparently made no difference to the Republicans on the panel that Talley, 36, never tried a single case and has been a lawyer for only three years. What qualifies him for the job? Maybe several incendiary blog posts, in which he denounced “Hillary Rotten Clinton” and called efforts at gun control legislation after the Sandy Hook Elementary School shootings the “greatest attack on our constitutional freedoms in our lifetime.” He also urged his readers to join the National Rifle Association. All of that combined surely contributed to the American Bar Association rating him as “not qualified.” Although he’s hardly unique. Four of Trump’s judicial nominees have received the rating that the ABA had not doled out since 2006. Talley’s nomination now has to go to the full Senate, which is also expected to approve his appointment on a party-line vote despite objections from civil rights groups. Trump has touted the way he has been able to fill judicial vacancies with staunch conservatives as one of the victories of his administration. Little wonder. When he came to power, there were more than 100 vacant seats in federal courts after Republicans basically blocked anyone proposed by President Obama in his last years in office. Trump has now nominated 59 people to federal courts, compared to the 27 judicial nominations Obama had made at this point in his presidency. Even critics agree this is one of the few things in which Trump’s administration actually seems to be succeeding. “This is the most under-appreciated aspect of the Trump presidency: judicial nominees are the only area in which the Republican White House is actually succeeding in getting what it wants,” MSNBC’s Steve Benen writes.